Leverage a proactive, rather than reactive, approach to healthcare. EMS Mobile Health helps providers reduce early hospital readmissions and the frequency of 911 calls from high users as well as educate patients with chronic illnesses to better manage their own care. How Does EMS Mobile Health Work? Provide an instant overview of new referrals, making it easy to manage caseloads and scale your program. 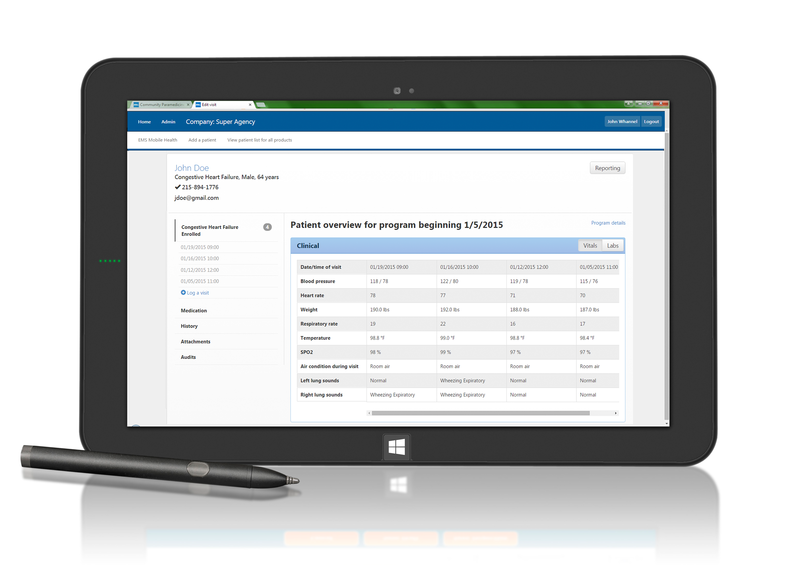 Share critical patient data with other health care partners. Focus on patient care over time instead of an event-based approach to patient care. Having the right solution in place will enable you to scale your program while maintaining the quality of services that set you apart. Simplify and expedite patient care documentation. Designed specifically for mobile integrated healthcare and community paramedicine, EMS Mobile Health allows you to securely access and edit a patient’s medical history. With EMS Mobile Health you can share critical patient data with other healthcare partners; receive automated alerts when vitals and lab values are out of normal range; and provide an instant overview of new referrals. Learn how to get reimbursed for your community program. Find out more about our EMS software solutions or request a demo.